I have been a big fan of Titanic Brewery for a long time. Like the ill-fated luxury liner herself, you can always expect quality, classy, refined flavors and beautiful designs on the labels and pump-clips. However, it’s unlikely that this brewery will be sunk anytime soon since their beers seem to be appearing everywhere at the moment (incuding Waitrose) so there’s no excuses not to take a cruise with these brews. One of my best memories of Titanic was a lovely strong beer called something like Shipwreck at the Southwestern Arms. I don’t have clear memories of exactly what this was (maybe one of you could tell me) but it went down far too easily for it’s strength and made me feel jolly perculiar through pint number three. I believe the only Titanic I have been disapppointed by was the Nine Tenths Below which recently made an appearance at the Weatherspoons Real Ale Festival, although I admit the style of this one is not generally the sort of thing I go for. I was very excited today when I saw that Weatherspoons are due to have a festival of Titanic beers between April 5th & 9th. Since I have spent my Sunday peddling up and down the hills of the Tennyson Trail on the Isle of Wight on my mountain bike (recommended by the way – just beautiful), my choice of beer tonight is a bit of an indulgent treat and a real firm favorite. 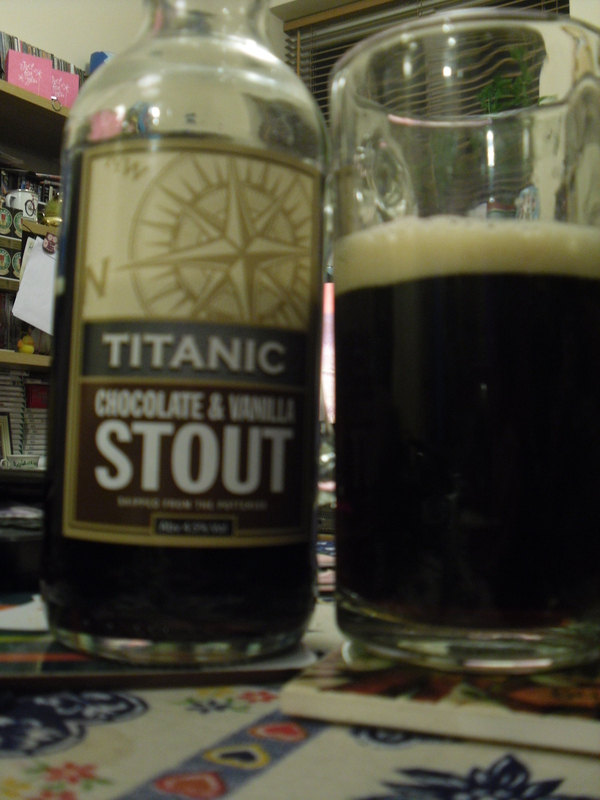 Titanic Chocolate & Vanilla Stout (4.5%ABV). The clear glass bottle allows you to be tantalised by the beautiful deep brown colour. When you open the bottle you are hit with the most incredible rich scent of chocolate and vanilla with a tiny whisper of espresso – I would consider wearing this scent it is so amazing and addictive. I literally sit here inhaling from the bottle like a crazy glue-sniffer but with a more refined palate. Pour it out and you discover the luxurious white head which is almost like a posh liquor coffee. The flavor lives up to the looks and aroma 100%. There’s literally enough flavor to sink the Titanic here. It feels thick and rich, almost creamy. There’s a definate sweetness but also a little dry bitterness at the back, perfectly balanced by the Madagascan vanilla. It’s the perfect grown-up pudding. The warmth and fullness of flavour makes you think it’s much stronger so it’s a really good one to round off a busy day. A fine,informative post.Titanic brewery brew some superb beers Hope you can have a look at my blog.Last post included some fell walking!